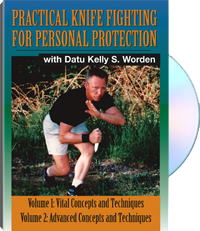 By combining his mastery of the Fillipino and Indonesian martial arts, Datu Kelly S. Worden has developed a devastatingly effective method of knife fighting. In Volume 1, Worden reveals his secrets of blade handling, the eight angles of attack, footwork and mobility, the use of the "live" hand and combining cutting and thrusting actions to devastate your attacker. In Volume 2, Worden teaches you the grim realities of using a knife for personal defense. He also reveals the secrets of using training dummies to perfect your technique, advanced live blade training methods, reverse-grip knife fighting instruction, as well as interviews with people who have witnessed the deadly effects of the knife firsthand. For academic study only. Kelly S. Worden is the founder of Natural Spirit International and Renegade Jeet Kune Do and is one of the most innovative minds in the martial arts world today. You can learn more about his work and programs at his website. 9) Training with the "Silent Partner"